We have been very lucky during our travelling so far: whenever something goes wrong with Casa, help always come along our way very quickly. This time, we were so lucky that we already had the help before we knew about the problem. This occurred last Friday. Just as we pulled into Santiago de Chile city, Casa started making some really loud and disturbing clunky sound. We had to pull an emergency stop off a highway and take a closer look. It turned out that Casa’s rear wheel ball bearing was completely shot. So there we were, in the middle of nowhere, stuck again. Fortunately we had pre-arranged couchsurfing for Santiago, and our host Javier was quick to rescue. He called the local BMW shop, and was able to arrange for a pickup transportation for Casa. Later on that weekend, fearing that we will be stuck in Santiago for a while for spare parts, I sent out a few more couchsurf requests, and received overwhelmingly positive responses. Thank you, Santiago hosts! The truth is that more and more, our travelling is less and less about tracking from point A to point B. The most interesting experiences often happen after the most frustrating incidents. In addition to tourist attractions, our journey are landmarked by friendly faces and warm families. It is incredible. Stuck as we are, we are more than happy to count our lucky stars in God’s office. Thanks, dude! 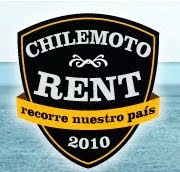 Finally a big THANK YOU to Chile Moto Rent on their kind offer of test-driving their BMW F650GS. Good luck with your business! !